It's Tiana's morning nap time! So, I have approximately an hour to blog, read, reply, and so on! :) This morning, I'll like to talk about people's comments about our family. This was inspired by a conversation I had with someone yesterday. Even though we cannot really be bothered by how people feel or think about our family (unless it's positive, of course! ), I think it is important to share a little bit of our experience and what it sounded like from our perspective. You might've said some of those things and did not realize how insensitive it may be but everybody could learn something new everyday. I love my family. I truly do. I love them because of who each of them are. Each one of them are amazing. Our culture, our history, our race are all big parts of who we are and we all celebrate each other in many different ways. That is extremely important. But what is also extremely important is who we are as individuals, to our core, our unique personalities and identities that make us uniquely us. That is important for people to understand, that although we are seen as this and that, we are a family and we love each other because we are James, Rose, Jada and Tiana. "Oh! Your husband is black? Wow..."
"I think it is nice that Jada looks like James, so people won't think she is adopted." "You should adopt a white child to even things out!" We adopt because this is how we want to create our family. If we could get pregnant naturally, we would be thrilled but this does not change the fact that we would continue to adopt children. This is the natural choice for us. Adopting our children has been nothing but a blessing and we would never choose to build our family any other way. We want children and we have two. This is really what is the most important. "I heard they usually end up with this or that." Our beautiful Jada Rose. She's an extremely strong survivor who beat many odds and proven many people wrong. She's spunky, full of life, has a big heart and whoever met her, fell in love with her. She is truly special and I am not just saying this because she is mine. She truly is. We adopted her when she was almost 4 years old. Past four years has been nothing but a wonderful adventure with her! "Couldn't you find a baby? That'll be easier." "You missed four years. You couldn't possibly bond in the same way with a baby." "Couldn't you just find a child who is only Deaf. Not with all those problems?" "If you had her earlier, she wouldn't have this or that." Our beautiful Tiana Joy. She is the newest bundle of joy and we are still learning more about her every single day. She's very laid back, very joyful, loves to be cuddled and she would never say no to any attention! She brings so much gentleness to our family and she really taught us to slow down, enjoy each single moment and just be together as a family. We've only had her for two months now but it's been nothing but amazing and we look forward to more! "Why would you make your life harder? She'll be so much work." So this wraps the long blog! I know this probably is a hot button topic for some of you but I thought it was important to share so you can understand it from the other perspective. I promise there will be more happy blogs coming up! :) Til then! 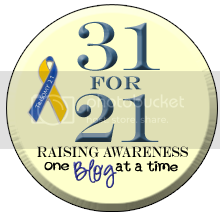 Awesome post and I am so happy to have found your blog via the 31 for 21! Your children are so beautiful! I love the facepaint pic, just lovely. First of all ... beautiful family picture!! Second of all -those comments, yikes! Some people seriously do not think before they speak or hear the words coming out of their mouths.